(1:00) ROULETTE / CASINO SOUNDS: A close-up recording of a casino roulette table with spinning sounds, ball rolling, croupier calling, chips being cleared and people talking and placing bets. Typical casino ambience delivered in CD quality WAV format (preview contains a security tone). 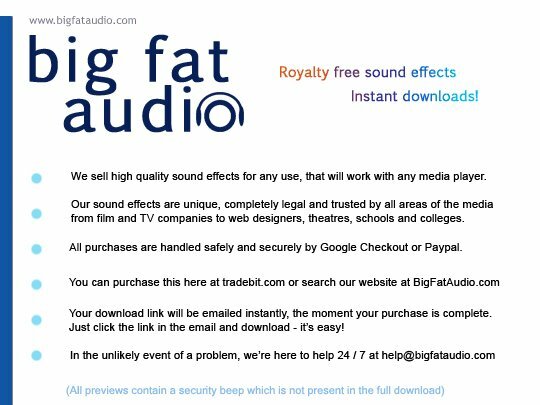 This sound effect is offered for royalty-free use by https://www.tradebit.com For your one-time PayPal payment you will receive immediate download instructions to gain access to your file(s).